» Klipsch vs Bose – What is the way for winners? Klipsch vs Bose – What is the way for winners? These days, a constant developing pace of technology has made it possible for audio brands to launch popular products. It is the reason why speakers recently keep showing capabilities which you could not search for in the past. Despite the same target towards high-quality sounds, Klipsch and Bose have a lot of differences, both good and bad ones. Owing to providing dozens of speakers which are not only strong but also durable, Bose’s products are suitable for outside spaces like boats. By contrast, Klipsch directs their focus on wireless audio devices structured with a tech so-called AptX. For the more detailed feature of these audio brands, now is time to understand each. How did the Klipsch begin their journey? As one of the first American loudspeakers companies, the Klipsch has consistently proved to be a premium brand for audiophiles and home theater enthusiasts around the world. Beginning in production in 1946, Klipsch has always followed the founder’s original point of view on the motto of producing premium speakers. 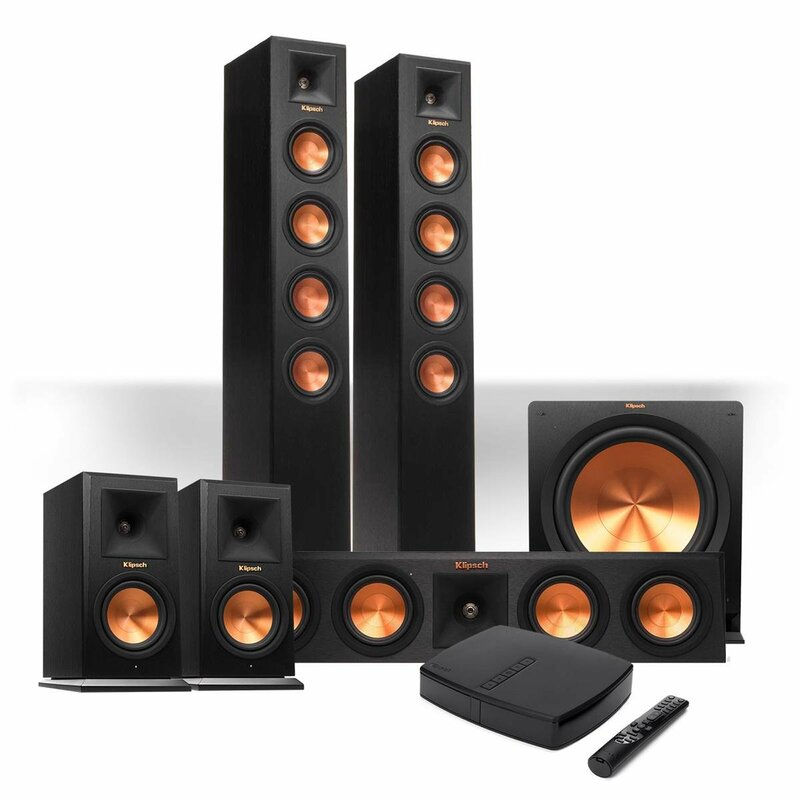 Followings are main product lines of the Klipsch. The Palladium loudspeakers can be considered as the technological peak and benchmarks of contemporary design. With seven different models, this Hi-end lineup brings lively music for listeners. They use new materials, new techniques as well as unique design for a balance of sound quality. Under creativity of many prestigious design teams worldwide, from Indianapolis, Indiana; Los Angeles, California; Hope, Arkansas, and elsewhere, the Palladium is regarded as a global symbol of Klipsch. In term of the aim to complement the most sophisticated Reference speakers, Hi-end components, hand-made, fully-equipped, under the cutting-edge technologies are in need. The brand reproduces sound with Accuracy and absolute fidelity whether using Home theater or two-channel music. Many of the speaker couples of Heritage, such as Klipschorn, La Scala, Heresy, and Cornwall, have been the hottest ones in the world of Hi-Fi sound. Derived from the love of music and the desire to enjoy a symphony orchestra in the listening room, pioneering engineer Paul W. Klipsch embarked on the design of the Heritage line. From then on, the whole world view of enjoying home music has changed radically. For the first time, everyone can enjoy the power, detail, and emotion of a real live performance at home. Formed by the legendary artists in Hope, Arkansas, where the Klipsch brand was launched, Heritage speakers have and will continue to exist over time. What is the story of Bose? Bose’s story begins with the one of an electronics enthusiast who likes to unleash the components, find out how they work and dream a day of inventing their product. Over the years, alongside traditional home audio products, the Bose Company has diversified its product range from sound filters to well-known theaters, from speakers with a large capacity for stadiums to music players fitted in the luxury cars such as Porsche and Mercedes or the audio equipment for the aircraft. In fact, Bose is not too attractive in the style of the headset, and the sound quality is pretty good. But when it comes to noise-canceling features, no one can beat such “big brother.” For example, the outstanding product of the brand is the Quiet Comfort line of headphones. They possess unique noise-canceling features, especially the new Quiet Comfort QC35. The only weakness of Bose is probably that it cannot catch up the trend. Let’s take the PXC 550 from Sennheiser as an instance. It offers both sound quality and noise reduction but is much better than the QC35. The reason is that the PXC 550 is a refreshingly designed, stylish and practical gadget for the user, while the QC35 still has something “old” features and also lack some fashionable features. Should we take a comparison of Klipsch vs Bose? Among masses of the audio manufacturing market, both Klipsch and Bose show their own strength in products. However, differences of Klipsch vs Bose will help you know more about them and get the best choices. The design of the Loose Bose is unidirectional, meaning that the sound will overwhelm the listening room, so using Bose to sing Karaoke or Dance music is appropriate. However, to enjoy other types of music, in addition to sound, listeners also require the speakers to show three-dimensional space, which this Bose cannot do. Therefore, few people use Bose speakers to listen to music. Although active noise cancellation is very attractive, there are several reasons why Klipsch decided not to go that trend. Firstly, it is not perfect. If it completely removes all external noise, that might be a beautiful thing, but it does not. It only lowers the low-frequency noise around you. This technology is in the KMC 3 speakers. It allows speakers to have a bit rate reduction that is much better than average while still maintaining high audio quality. Secondly, active noise cancellation adds noise. The electronic devices that run inside your headset emit a signal designed to eliminate external noise. However, the noise is not eliminated from the main electronics. Thirdly, electronic circuits create noise against external sounds that affect the music itself. That noise can cancel the change of music signal.